Are you ready to take your dance passion to next level? 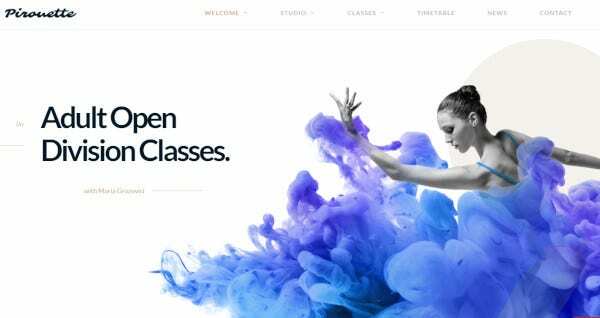 Take your passion to people all over the world with your Dance Studio WordPress website. Launch your website today with some of the best WordPress themes and templates in the market that can help you grow your passion. Here is the list to make your task simple and easy. 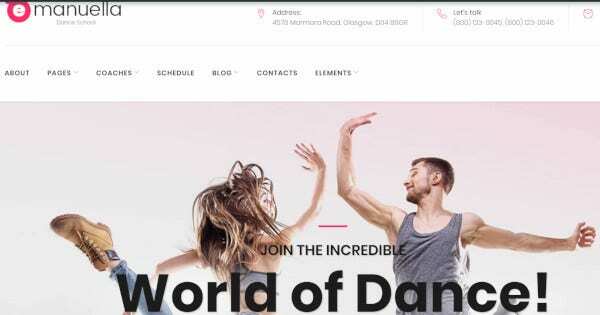 Launch your dance studio venture with one of the best WordPress themes which includes 99+ Custom Short codes that works super for website pages. Website appearance customization is made easy and simple with hundreds of Google fonts. 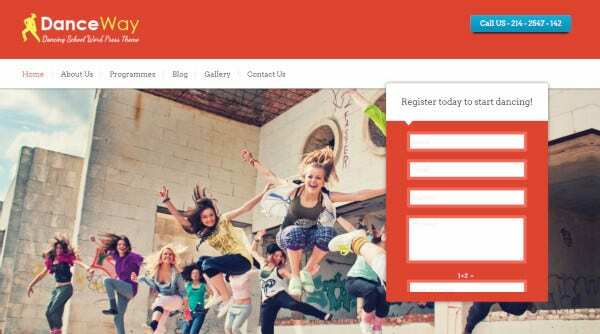 You can offer and schedule different dance classes with the help of this theme. Reach out to people from around the world with translation ready and WPML compatible website. 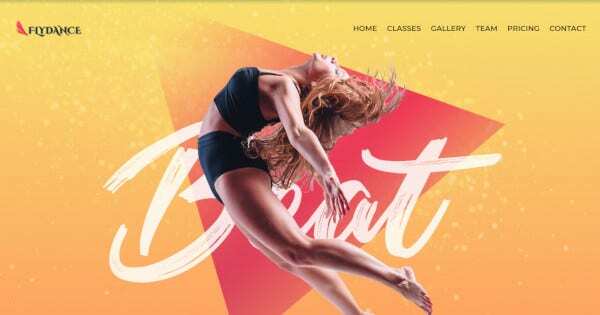 This a powerful WordPress theme that makes it easy to build a professional dance studio website. 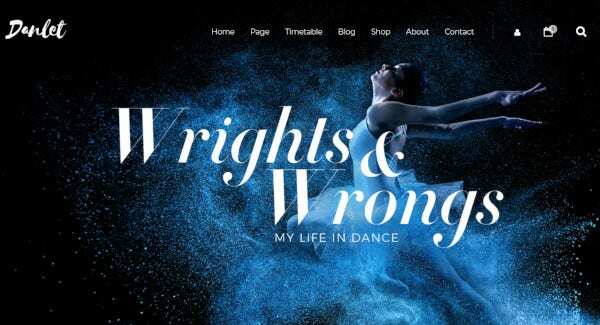 You can create different dance styles website with eight homepage designs and website demos. In built WooCommerce plugin support makes the website more functional in terms of payment collection for your classes and products. Showcase background videos on your homepage with the help of Slider Revolution plugin. 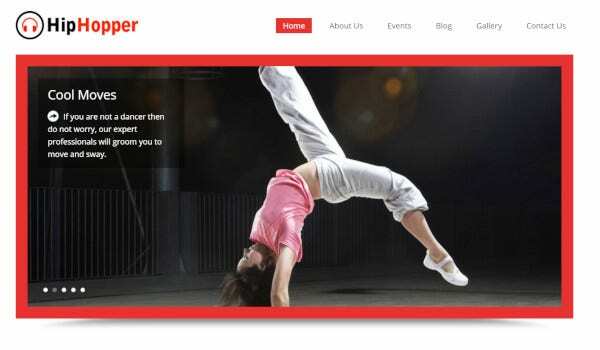 Customize and build your dance venture website with stylish pages, amazing elements of Flydance WordPress theme. Create your content with elementor page builder, free images, that helps to make your website unique as per your style. Jet elements plugin, 24/7 lifetime support gives you a strong backup to build your website with ease. SEO-friendly, WPML ready, retina ready, fully responsive designs are few features of this theme that keeps you on top from your peers. Head start with dynamic Pirouette WordPress theme and build your modern website in minutes. Several premium plugins like visual composer, slider revolution, events schedule are included for free in this theme which can kickstart your business in no time. Stunning sliders and images, amazing carousels and footers helps you to make an impactful website to reach your customers. Enrich the experience of your users by using this theme for your website. Create exclusive website with help of dynamic page elements of this theme. 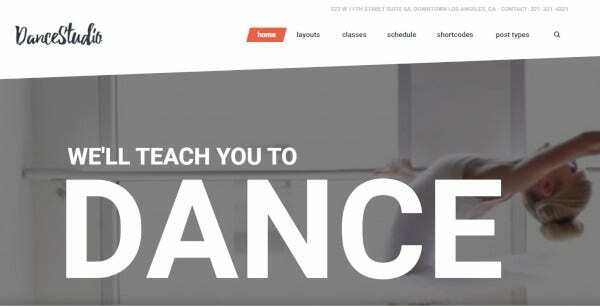 Instructor profiles, class discounts can be promoted through amazing image sliders. Live Customizer includes custom colors and fonts that gives good number of customization options. Display customized sections on your website with the help of drag-and-drop builder. Layout tools can adjust each page layout in minutes. Appointment manager tracks and schedules all the bookings. Grab the attention of your visitors by using amazing inner pages, ready to use content, handcrafted elements, plugins and addons of this unique WordPress theme. 11 header styles help you to customize your website as per your needs. Drag and drop facility helps non coders to build the website easily. Customization panel can be customized with the help of Kirki customizer. 6 blog layouts and 9 portfolio types help you to create website as per your style to reach the right audience. Venture in your website creation by using fully responsive design of Emanuella. Grab your audience attention by amazing background video, elegant tones, and Parallax animation. Timetable plugin lets you incorporate your dance class schedules in style. Make your site reliable with the help of Cherry Team Members and Cherry Testimonials. Large number of blog layouts, header & footer styles will help you to create a different website that will stand out from the crowd. Website creation is made easy and simple with large pool of layouts which gives room for you to experiment. Multiple content can be added with the help of content modules that includes sliders, buttons, images, pricing tables, contact forms. Appointment Manager plugin makes the website more productive. Each event can be displayed in a customized style. Custom widgets improves online performance of your website. 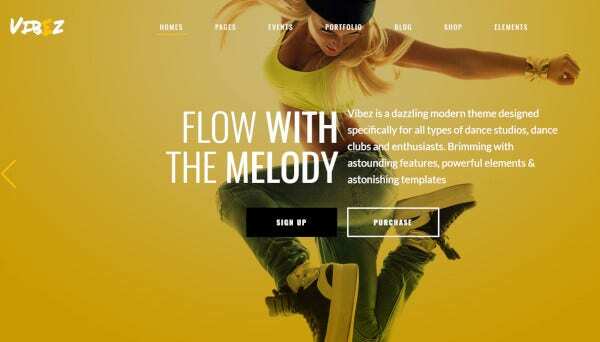 500+ Google fonts and clean code helps you to create an amazing website easily. This is a responsive WordPress theme which comes with plenty of bright color options that can give attractive look to your website. There is inbuilt customization form, full width slider, 4 columns featured area, social media integration, customization footer area, widget footer and amazing designs, which makes this theme very easy to use and can be installed with a single click on the Dashboard. This theme provides 100% responsive design, multilingual ready official WPML certification, 80+ shortcodes. Typography can be customized with the help of 600+ Google fonts. Multiple color options let you explore different colors to make a creative website. Images can be shared in fantastic sliders. 2 step installation makes your work easy and simple that helps you to create website in minutes. Filterable portfolio, advanced backup, custom widgets, lifetime free updates add extra value to your site. Website creation is made easy with this fully responsive theme which is also compatible among all major browsers. This theme includes attractive thumbnail sliders, landscape layout and 2 column layout with unlimited drop down menu level. Copying of website text or images are disabled with the help of image security feature. Page templates is divided in blog template, portfolio template and contact template to make your site look organised and attractive. Theme options panel is easy to use and detailed documentation gives you an opportunity to develop your website step by step. Amazing photo blog and easy site navigation features of this theme will help you to attract more customers. 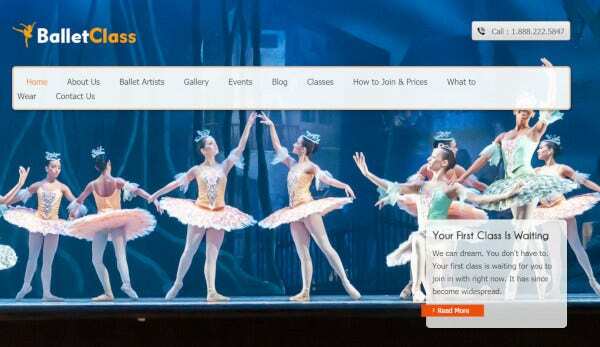 Danlet WordPress theme helps you to install your dance studio website with 1 click. Fully responsive layout, drag and drop page builder, WooCommerce support, free lifetime update makes this theme compatible with your requirements. Few amazing features like, 4 homepage styles, contact form 7 plugin, powerful admin interface, 600+ Google fonts help you to build an unique website as per your taste. Go ahead and build your dream website today. This retina ready WordPress theme is SEO optimized with advance theme options panel. You can easily install and setup this theme as per your style. This theme has customizable footer widgets area, contact page map, aligned center, 3 column featured area, social media icons, amazing styling options, custom CSS option, beautiful typography with attractive design, full width slider on home page. This theme is also fully responsive, compatible with WordPress plugins, RTL compatible, translation ready. Select this theme today to build a world class website. This responsive WordPress theme has Ajax based theme options panel with pre-built page templates and pre-defined colors. This theme includes social icon integration, multiple unique color template, contact page templates with google map, lifetime support, regular product updates, awesome slider and custom templates. In today’s digital world it’s very important to reach your customers through online presence. So make your choice today and select one of the themes to create an awesome website.